Since going back to work as a new mom, I’ve had to compromise some of my food values- mostly, I’ve had to embrace processed food. Ella loves frozen waffles and frozen spinach and dinner is so much easier with a rotisserie chicken. Left box, Whole Foods Market 365 Frozen Jasmine Rice (just heat in the microwave!! I love it), Butter Curry sauce, heated with Whole Foods Market Frozen Collard Greens, Onions, and Diced Rotisserie Chicken. Can I just tell you this meal took less than 10 minutes to assemble?!? For realsy. 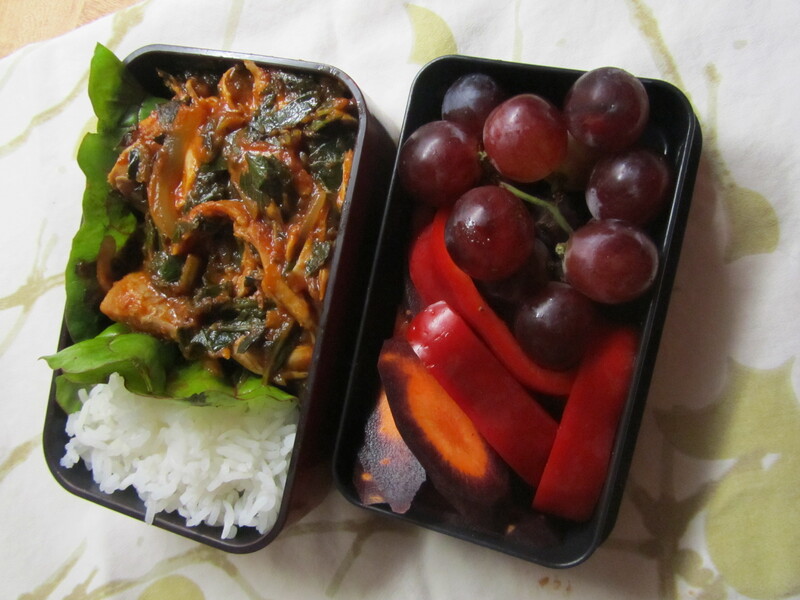 The box on the right contains red grapes, red bell pepper (more vitamin c than an orange !!!) and sliced purple carrots, that aren’t totally purple- clearly. And yes, this is my new bento box! Thanks for asking. I’m flattered that you noticed. PUBLISHED ON September 13, 2011 by Maryin Bento!